A write on glow in the dark menu board for everyday use in restaurants, shops & bars. Neon menu board. 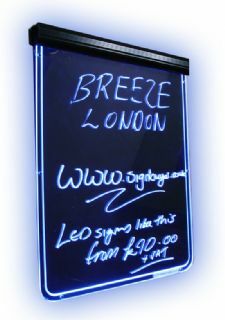 A write on Neon menu board that glows in the dark menu board for everyday use in restaurants, shops & bars. Aluminium Light bar, black powder coating. Included GS or UL or BS etc adaptor. Included one bottle of spray cleaner snd two pcs cleaning cloths. These are manufactured to an extremely high standard and i have not seen better for illumination and ease of use. This menu board gradually changes colour through 7 different colours. Blue, Red, Green, White, Pink, Purple, Yellow. Please choose delivery and quantity options from the checkout area, thank you.